Carmen A. Catanese spent 8 months and 4 days on Guam arriving 4 Apr 1945 and departing 28 Dec 1945. 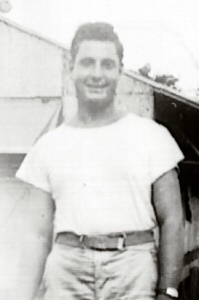 During his service on Guam he served 6 months as Crew Chief; was responsible for the maintenance of the aircraft at all times; inspected the maintenance and repair of airplanes, observed operation of airplane power plants and made adjustments as necessary for proper functioning; made replacements and assisted in removal and installation of new engines. He was discharged from the AAF in January 1946. In March of 1946, was accepted for Civil Service employment at Fort Dix (N.J.) as a clerk-typist. He attended evening classes at Rider College in Lawrenceville , NJ , earning a bachelor’s degree in Business Administration in 1953. He began work on the Fort Dix Post newspaper in 1948 and became its editor in 1952. During his 16 year tenure as editor, the Fort Dix Post received numerous awards and citations, including citations from the Department of the Army and the Armed Forces Press Service. It was noted that the Fort Dix Post was being used as a prime example of a post newspaper at classes at the Defense Information School at Fort Benjamin Harrison. In addition to being editor, Mr. Catanese served on many organizations and committees. He died suddenly at his office on June 28,1968 and was buried with full military honors on July 1, 1968 in Trenton NJ. Carmen Catanese is also pictured with P-62's Ground Crew; It's unknown which crew he was crew chief of.